In many decision making situations, it is necessary to gather the group consensus. This happens when a group of friends decides which movie to watch, when a company decides which product design to manufacture, and when a democratic country elects its leaders. While the basic idea of voting is fairly universal, the method by which those votes are used to determine a winner can vary. Amongst a group of friends, you may decide upon a movie by voting for all the movies you’re willing to watch, with the winner being the one with the greatest approval. A company might eliminate unpopular designs then revote on the remaining. A country might look for the candidate with the most votes. In deciding upon a winner, there is always one main goal: to reflect the preferences of the people in the most fair way possible. In this lesson, we will study Preference Schedules and Preference Ballots as a means of deciding upon the winner of an election. A preference ballot is a ballot in which the voter ranks the choices in order of preference. To begin, we’re going to want more information than a traditional ballot normally provides. A traditional ballot usually asks you to pick your favorite from a list of choices. This ballot fails to provide any information on how a voter would rank the alternatives if their first choice was unsuccessful. A preference ballot is a ballot in which the voter ranks the choices in order of preference. Notice that by totaling the vote counts across the top of the preference schedule we can recover the total number of votes cast: [latex]1+3+3+3=10[/latex] total votes. The following video will give you a summary of what issues can arise from elections, as well as how a preference table is used in elections. The voting method we’re most familiar with in the United States is the plurality method. In this method, the choice with the most first-preference votes is declared the winner. Ties are possible, and would have to be settled through some sort of run-off vote. This method is sometimes mistakenly called the majority method, or “majority rules”, but it is not necessary for a choice to have gained a majority of votes to win. A majority is over 50%; it is possible for a winner to have a plurality without having a majority. Anaheim is the winner using the plurality voting method. Notice that Anaheim won with 4 out of 10 votes, 40% of the votes, which is a plurality of the votes, but not a majority. Three candidates are running in an election for County Executive: Goings (G), McCarthy (M), and Bunney (B) The voting schedule is shown below. Which candidate wins under the plurality method? Note: In the third column and last column, those voters only recorded a first-place vote, so we don’t know who their second and third choices would have been. The election from the above example may seem totally clean, but there is a problem lurking that arises whenever there are three or more choices. Looking back at our preference table, how would our members vote if they only had two choices? This doesn’t seem right, does it? Anaheim just won the election, yet 6 out of 10 voters, 60% of them, would have preferred Hawaii! That hardly seems fair. Marquis de Condorcet, a French philosopher, mathematician, and political scientist wrote about how this could happen in 1785, and for him we name our first fairness criterion. The fairness criteria are statements that seem like they should be true in a fair election. If there is a choice that is preferred in every one-to-one comparison with the other choices, that choice should be the winner. We call this winner the Condorcet Winner, or Condorcet Candidate. In the election, what choice is the Condorcet Winner? We see above that Hawaii is preferred over Anaheim. Comparing Hawaii to Orlando, we can see 6 out of 10 would prefer Hawaii to Orlando. Since Hawaii is preferred in a one-to-one comparison to both other choices, Hawaii is the Condorcet Winner. So in this election, the Democratic voters split their vote over the two Democratic candidates, allowing the Republican candidate Elle to win under the plurality method with 40% of the vote. So even though Don had the smallest number of first-place votes in the election, he is the Condorcet winner, being preferred in every one-to-one comparison with the other candidates. If you prefer to watch a video of the previous example being worked out, here it is. Consider the election from the previous Try It Now. Is there a Condorcet winner in this election? Situations when there are more than one candidate that share somewhat similar points of view, can lead to insincere voting. Insincere voting is when a person casts a ballot counter to their actual preference for strategic purposes. In the case above, the democratic leadership might realize that Don and Key will split the vote, and encourage voters to vote for Key by officially endorsing him. Not wanting to see their party lose the election, as happened in the scenario above, Don’s supporters might insincerely vote for Key, effectively voting against Elle. The following video gives another mini lesson that covers the plurality method of voting as well as the idea of a Condorcet Winner. Instant Runoff Voting (IRV), also called Plurality with Elimination, is a modification of the plurality method that attempts to address the issue of insincere voting. In IRV, voting is done with preference ballots, and a preference schedule is generated. The choice with the least first-place votes is then eliminated from the election, and any votes for that candidate are redistributed to the voters’ next choice. This continues until a choice has a majority (over 50%). This is similar to the idea of holding runoff elections, but since every voter’s order of preference is recorded on the ballot, the runoff can be computed without requiring a second costly election. This voting method is used in several political elections around the world, including election of members of the Australian House of Representatives, and was used for county positions in Pierce County, Washington until it was eliminated by voters in 2009. A version of IRV is used by the International Olympic Committee to select host nations. Consider the preference schedule below, in which a company’s advertising team is voting on five different advertising slogans, called A, B, C, D, and E here for simplicity. If this was a plurality election, note that B would be the winner with 9 first-choice votes, compared to 6 for D, 4 for C, and 1 for E.
There are total of 3+4+4+6+2+1 = 20 votes. A majority would be 11 votes. No one yet has a majority, so we proceed to elimination rounds. We then shift everyone’s choices up to fill the gaps. There is still no choice with a majority, so we eliminate again. Round 2: We make our second elimination. Choice E has the fewest first-place votes, so we remove that choice, shifting everyone’s options to fill the gaps. Notice that the first and fifth columns have the same preferences now, we can condense those down to one column. Now B has 9 first-choice votes, C has 4 votes, and D has 7 votes. Still no majority, so we eliminate again. Round 3: We make our third elimination. C has the fewest votes. D has now gained a majority, and is declared the winner under IRV. The following video provides another view of the example from above. Consider again this election. Find the winner using IRV. Here is an overview video that provides the definition of IRV, as well as an example of how to determine the winner of an election using IRV. Let’s return to our City Council Election. In this election, Don has the smallest number of first place votes, so Don is eliminated in the first round. The 214 people who voted for Don have their votes transferred to their second choice, Key. So Key is the winner under the IRV method. We can immediately notice that in this election, IRV violates the Condorcet Criterion, since we determined earlier that Don was the Condorcet winner. On the other hand, the temptation has been removed for Don’s supporters to vote for Key; they now know their vote will be transferred to Key, not simply discarded. In the following video, we provide the example from above where we find that the IRV method violates the Condorcet Criterion in an election for a city council seat. Consider the voting system below. In this election, Carter would be eliminated in the first round, and Adams would be the winner with 66 votes to 34 for Brown. Now suppose that the results were announced, but election officials accidentally destroyed the ballots before they could be certified, and the votes had to be recast. Wanting to “jump on the bandwagon,” 10 of the voters who had originally voted in the order Brown, Adams, Carter change their vote to favor the presumed winner, changing those votes to Adams, Brown, Carter. If voters change their votes to increase the preference for a candidate, it should not harm that candidate’s chances of winning. This criterion is violated by this election. Note that even though the criterion is violated in this particular election, it does not mean that IRV always violates the criterion; just that IRV has the potential to violate the criterion in certain elections. The last video shows the example from above where the monotonicity criterion is violated. Borda Count is another voting method, named for Jean-Charles de Borda, who developed the system in 1770. In this method, points are assigned to candidates based on their ranking; 1 point for last choice, 2 points for second-to-last choice, and so on. The point values for all ballots are totaled, and the candidate with the largest point total is the winner. A group of mathematicians are getting together for a conference. 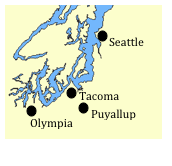 The members are coming from four cities: Seattle, Tacoma, Puyallup, and Olympia. Their approximate locations on a map are shown below. Use the Borda count method to determine the winning town for the conference. Under the Borda Count method, Tacoma is the winner of this vote. Here is a video showing the example from above. Consider again the election from earlier. Find the winner using Borda Count. Since we have some incomplete preference ballots, for simplicity, give every unranked candidate 1 point, the points they would normally get for last place. What’s Wrong with Borda Count? If a choice has a majority of first-place votes, that choice should be the winner. The election from the previous example using the Borda Count violates the Majority Criterion. Notice also that this automatically means that the Condorcet Criterion will also be violated, as Seattle would have been preferred by 51% of voters in any head-to-head comparison. Borda count is sometimes described as a consensus-based voting system, since it can sometimes choose a more broadly acceptable option over the one with majority support. In the example above, Tacoma is probably the best compromise location. This is a different approach than plurality and instant runoff voting that focus on first-choice votes; Borda Count considers every voter’s entire ranking to determine the outcome. Because of this consensus behavior, Borda Count, or some variation of it, is commonly used in awarding sports awards. Variations are used to determine the Most Valuable Player in baseball, to rank teams in NCAA sports, and to award the Heisman trophy. So far none of our voting methods have satisfied the Condorcet Criterion. The Copeland Method specifically attempts to satisfy the Condorcet Criterion by looking at pairwise (one-to-one) comparisons. In this method, each pair of candidates is compared, using all preferences to determine which of the two is more preferred. The more preferred candidate is awarded 1 point. If there is a tie, each candidate is awarded ½ point. After all pairwise comparisons are made, the candidate with the most points, and hence the most pairwise wins, is declared the winner. Variations of Copeland’s Method are used in many professional organizations, including election of the Board of Trustees for the Wikimedia Foundation that runs Wikipedia. Consider our vacation group example from the beginning of the chapter. Determine the winner using Copeland’s Method. We need to look at each pair of choices, and see which choice would win in a one-to-one comparison. You may recall we did this earlier when determining the Condorcet Winner. For example, comparing Hawaii vs Orlando, we see that 6 voters, those shaded below in the first table below, would prefer Hawaii to Orlando. Note that Hawaii doesn’t have to be the voter’s first choice—we’re imagining that Anaheim wasn’t an option. If it helps, you can imagine removing Anaheim, as in the second table below. Based on this, in the comparison of Hawaii vs Orlando, Hawaii wins, and receives 1 point. Comparing Anaheim to Orlando, the 1 voter in the first column clearly prefers Anaheim, as do the 3 voters in the second column. The 3 voters in the third column clearly prefer Orlando. The 3 voters in the last column prefer Hawaii as their first choice, but if they had to choose between Anaheim and Orlando, they’d choose Anaheim, their second choice overall. So, altogether [latex]1+3+3=7[/latex] voters prefer Anaheim over Orlando, and 3 prefer Orlando over Anaheim. So, comparing Anaheim vs Orlando: 7 votes to 3 votes: Anaheim gets 1 point. Hawaii is the winner under Copeland’s Method, having earned the most points. Notice this process is consistent with our determination of a Condorcet Winner. Here is the same example presented in a video. Consider the advertising group’s vote we explored earlier. Determine the winner using Copeland’s method. Using Copeland’s Method, we declare D as the winner. Notice that in this case, D is not a Condorcet Winner. While Copeland’s method will also select a Condorcet Candidate as the winner, the method still works in cases where there is no Condorcet Winner. Watch the same example from above being worked out in this video. Consider again the election from earlier. Find the winner using Copeland’s method. Since we have some incomplete preference ballots, we’ll have to adjust. For example, when comparing M to B, we’ll ignore the 20 votes in the third column which do not rank either candidate. What’s Wrong with Copeland’s Method? As already noted, Copeland’s Method does satisfy the Condorcet Criterion. It also satisfies the Majority Criterion and the Monotonicity Criterion. So is this the perfect method? Well, in a word, no. Suddenly Anna is the winner! This leads us to another fairness criterion. If a non-winning choice is removed from the ballot, it should not change the winner of the election. Equivalently, if choice A is preferred over choice B, introducing or removing a choice C should not cause B to be preferred over A. In the election from the last example, the IIA Criterion was violated. Another disadvantage of Copeland’s Method is that it is fairly easy for the election to end in a tie. For this reason, Copeland’s method is usually the first part of a more advanced method that uses more sophisticated methods for breaking ties and determining the winner when there is not a Condorcet Candidate. So Where’s the Fair Method? At this point, you’re probably asking why we keep looking at method after method just to point out that they are not fully fair. We must be holding out on the perfect method, right? Unfortunately, no. A mathematical economist, Kenneth Arrow, was able to prove in 1949 that there is no voting method that will satisfy all the fairness criteria we have discussed. Arrow’s Impossibility Theorem states, roughly, that it is not possible for a voting method to satisfy every fairness criteria that we’ve discussed. No matter whom we choose as the winner, 2/3 of voters would prefer someone else! This scenario is dubbed Condorcet’s Voting Paradox, and demonstrates how voting preferences are not transitive (just because A is preferred over B, and B over C, does not mean A is preferred over C). In this election, there is no fair resolution. It is because of this impossibility of a totally fair method that Plurality, IRV, Borda Count, Copeland’s Method, and dozens of variants are all still used. Usually the decision of which method to use is based on what seems most fair for the situation in which it is being applied.